SmartForce is a semi-automatic grinding, deburring, and polishing robotic cell that combines minimal operator involvement with robotic functions. 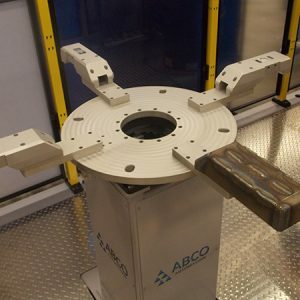 ABCO’s turnkey system offers manufacturers a complete package that bundles ABCO’s unique design with high-end “off-the-shelf” components, such as a KUKA Robot, 3M™ Abrasives, PushCorp End-of-Arm Tool, Coolmate™ Cooling System, metal skid base, and part infeed table. More importantly, SmartForce is pre-engineered and pre-built, allowing manufacturers to use the cell without delays—there is minimum installation for the initial setup. SmartForce is easy to use and requires nominal plant resources or operator training—and it’s available through ABCO’s quick ship program. With a compact footprint that is less than 100 square feet, SmartForce is mobile and flexible. The cell is pre-assembled and installed on a metal skid base, therefore allowing simple integration into existing manufacturing facilities as well as easy movement within the site. Encompassing a modular design, SmartForce can integrate with other components, such as conveyors and post-process inspection equipment, to further automate the cell. 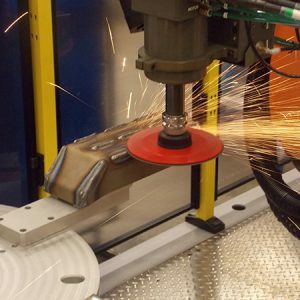 Whether protecting personnel from coming into direct contact with metal swarf, the robot, or end-of-arm tooling, SmartForce’s perimeter of safety guarding helps keep the working environment safe. Housed within the safety guarding is the hub of the cell: a KUKA KR 60-3 F. This robot works with a range of metals, including the most intricate light alloy components to large-format steel parts. And, with protective coatings and special seals, the robot resists heat as well as corrosion from alkalis, acids, and abrasive particles, thus allowing it to safely work in harsh environments. SmartForce employs a recipe-based control system; the operator selects a pre-set program that instructs the robot on its path and operations. Recipes can include individual tasks for grinding, deburring, and polishing or any combination of the three. To load parts, the operator simply opens the cell door, removes a finished part, and places a new workpiece on the part infeed table. 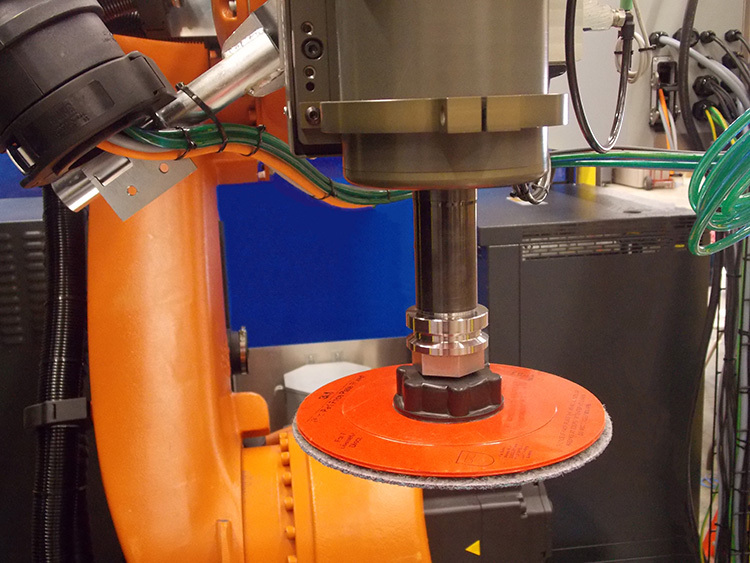 The robot performs the grinding task first, then completes the part with deburring and polishing. When a part is finished, the robot rotates the dial table and indexes to the next position, allowing the robot process the next part.